All projects are counted by the number of full size Allan Block units used. If smaller sized units are used, the number of blocks must be equivalent to full size units. Example: 2 AB Jumbo Juniors = 1 AB Classic (full size unit). Contractors that build their first wall with either the AB Collection or the AB Europa Collection will become Level One Certified. 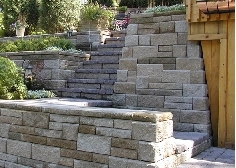 Contractors who build their first AB Fieldstone Collection wall will become AB Fieldstone Certified. 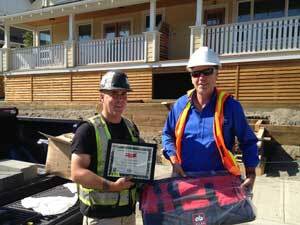 Disclaimer: Becoming a certified contractor signifies that a contractor has been to an Allan Block Certification class and has been trained. 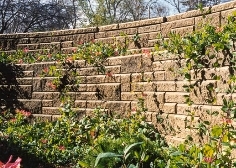 Allan Block does not guarantee the performance of any wall constructed by a certified contractor. 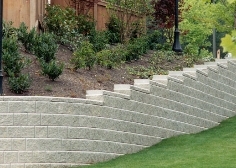 The Allan Block Contractor Certification Program is designed to give contractors the proper training and tools to ensure top quality retaining walls are built. As a leader in the industry, Allan Block Corporation has developed these tools and training programs to help contractors get the knowledge and the resources they need. With the help of our vast network of trained Allan Block representatives, thousands of professionals have already taken advantage of our installation training, technical support, and the many tools we have available to help them plan, design and build with Allan Block products. This three-stage program blends the details of wall design and the experience of wall construction to help us define each contractor’s individual level of ability and service. This on-going certification program has also helped us provide a better understanding of how and why stackable structures work so well. Proper methods for constructing an Allan Block wall. At the completion of the course you will be asked to take a written test. This test must be completed and turned in to your local Allan Block sales representative. Once this has been done, the last step is for you to build an Allan Block wall that has a minimum height of 3 ft (0.9 m) and is a minimum of 300 units (full size or equivalent). Notify your local sales representative of the completion of these requirements so that your local sales representative can submit the appropriate paperwork to Allan Block Corp. to receive your Allan Block Certified Wall Installer Certificate. 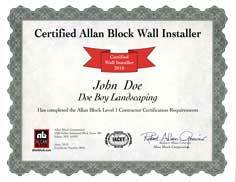 Notify your local Allan Block sales representative of any AB walls you would like submitted toward your Experienced Wall Installer certification so that your local sales representative can submit the appropriate paperwork to Allan Block Corp. to receive your Allan Block Experienced Wall Installer Certificate. The third and final step in the program is the Master Wall Builder. Contractors that reach this level have both the knowledge and the skills to build top quality Allan Block walls. Set apart from other wall installers, the Master Wall Builder is more widely accepted and sought after by the engineering community. A letter of reference from a minimum of 2 general contractors/property owners/developers. The AB sales representative is responsible for obtaining these letters directly from the general contractor/property owner/developer and must submitted to Allan Block Corp. Notify your local Allan Block sales representative of any AB walls you would like submitted toward your Master Wall Builder certification so that your local sales representative can submit the appropriate paperwork to Allan Block Corp. to receive your Allan Block Master Wall Builder plaque with reward.